San Jose police on Wednesday shot a 26-year-old man who they say was attacking his mother with an ax. Swarms of officers, firefighters and paramedics were in the 1400 block of Lansing Avenue at Jarvis Avenue near Almaden Expressway about 7:15 a.m. Officers had been in the area to help with an unrelated traffic collision, police said. "Officers were stopped on the street when they heard the commotion of the domestic incident," San Jose Police Lt. Tom Sims said. "The suspect was chasing his mother out of the house, had an ax and struck the mother." Officers tried to get the man to drop the ax, police said, but he turned toward them. Two officers fired their weapons, police said. 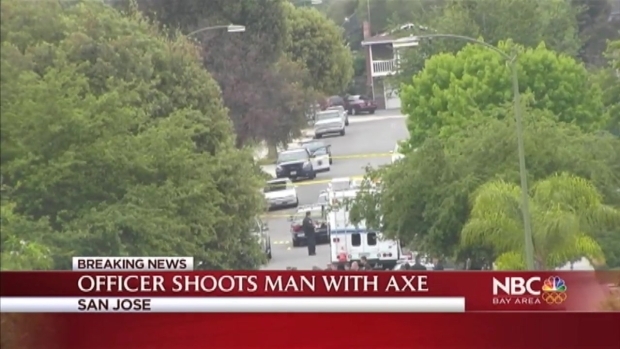 San Jose police on Wednesday shot a 26-year-old man who they say was attacking his mother with an ax. Damian Trujillo reports. Both the son and mother were taken to the hospital. More information was not immediately revealed. This is the second instance in less than a month where a child has been accused of attacking a parent, and Sims said it was not easy to explain the "family on family violence" in the last few weeks. "I don't know what to tell you. It's a little frightening to see some of the violence occurring withing the family situation," Sims said. "We'll be out there doing the best we can."